Shantae And The Pirate's Curse is currently one of the most eagerly-awaited 3DS titles in the Nintendo Life office, but this is an adventure so epic that it simply couldn't be contained to a single system. We're pleased to share the exclusive early news that WayForward is also bringing Shantae's latest outing to the Wii U eShop. 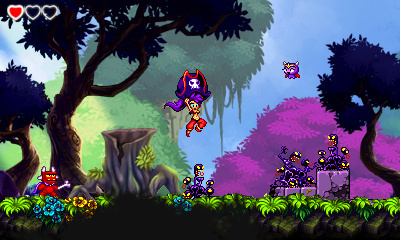 The third game in the popular Shantae series which began back in 2002 on the Game Boy Color, Pirate's Curse is the biggest adventure yet — according to WayForward, it boasts more than double the content seen in its 2010 predecessor, Shantae: Risky’s Revenge. The 3DS version is already shaping up very nicely indeed, with some gorgeous character art — courtesy of IntiCreates — and superb use of the console's auto-stereoscopic display. However, the Wii U version takes things to another level entirely, mixing HD artwork with pixel-based sprites. It will also boast off-TV play, thanks to the Wii U GamePad. What is universal across both versions is the touch-based inventory management system and a real-time map, displayed on the lower screen on the 3DS and the GamePad screen on the Wii U. As before, our heroine is able to whip enemies into submission with her deadly hair, and will be expected to run and jump through various locations. There's also a focus on exploration, which will no doubt be aided by the inclusion of that aforementioned real-time map. You'll be able to unlock new abilities as you get deeper into the game, while the trademark humour which has typified the series so far will also be present and correct. 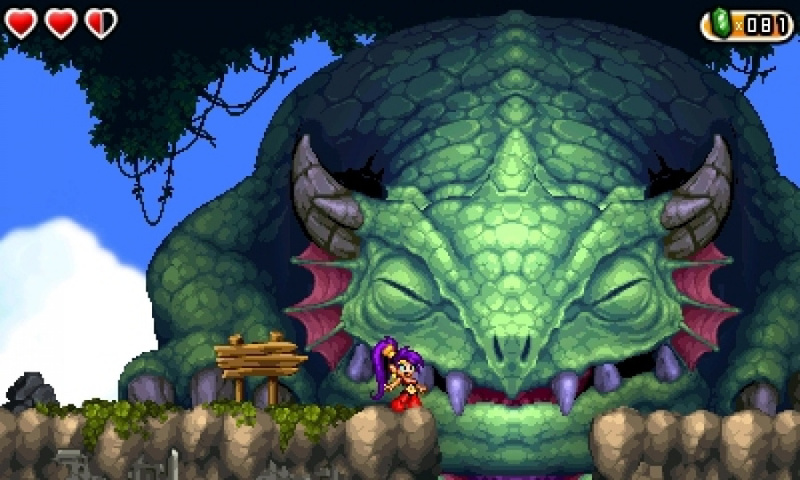 One of the big gameplay changes this time around is what Shantae doesn't have access to. She is stripped of her dancing skills in this particular instalment and must instead make use of various pirate weapons she finds during her quest. These include a Flintlock Pistol (to blast enemies and hit switches from afar), Pirate Hat (to glide on the wind), Scimitar (to get the drop on your foes with a skull-cracking attack from above), Risky’s Boots (to run at super speeds) and a good, old-fashioned Cannon (to blast yourself into the air on a belch of black powder). To get a better idea of what's in store, we spoke to WayForward Creative Director and founding member Matt Bozon about the game. What are the defining features that distinguish this entry from its two predecessors? The biggest shift is the Pirate Weapons. This time out Shantae can't use her dance magic, so she’s forced to learn new tricks in order to vanquish foes and overcome puzzles. The pirate theme isn't just for story; each item can be used offensively and defensively. You can destroy obstacles with your Scimitar, but it's also a weapon. Same goes for the Flintlock Pistol – it can hit switches but also blasts monsters at long range. It’s a pretty big departure from the creature transformations seen in the other games in the series. 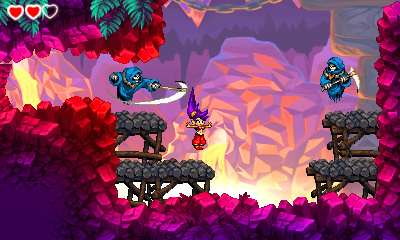 The quest flow is quite different too, with Shantae and Risky sailing together from one land to the next. There is a lot of freedom to explore in Pirate’s Curse. We also have a MAP in the game! It works like the maps in Super Metroid or Castlevania: Symphony of the Night, which was a popular request by fans. Last, the scope is a huge change from Risky’s Revenge. 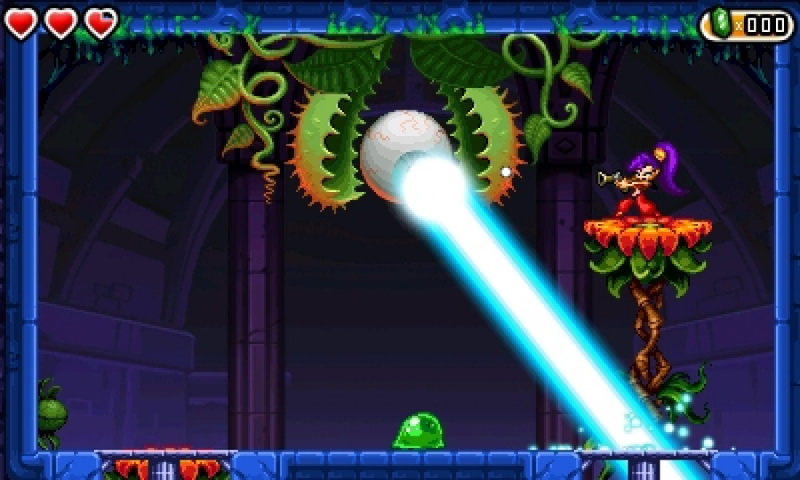 Pirate’s Curse is the size and scope of a traditional retail game. After working on it non-stop for a full two years, we didn't want to skimp on the size. It’s more than twice the size of the previous game! We're deploying the same pixel-based game to both 3DS and Wii U. However, the Wii U version will use the high resolution source character art provided by IntiCreates for menus, cutscenes, and character dialogue. Just to be clear, the "in game" art remains pixel-based on Wii U. 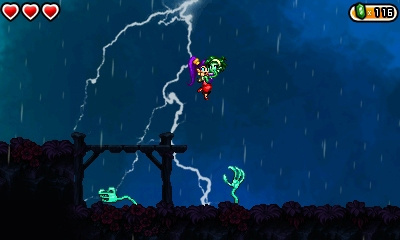 Has the Shantae: Half-Genie Hero project had any impact on Pirate's Curse, or vice-versa, during development, whether in terms of resources, design ideas and so on? Not at all, since they are completely separate teams. The only impact is on my sanity. Which is... what were we talking about that huh, who? The ham biscuit. Ahem. If anything we're more freed up since HERO has a nice budget to work with. Getting funding from our fans has really helped HERO to breathe on its own, so we’re extremely grateful! The Kickstarter campaign did slow me down for a good month there, but the CURSE team kept chugging along without me until I could catch up. They're a great team, and the games have very distinct personalities as a result. Do you have a planned release window for Pirate's Curse and a final message for our readers? Yes, we finally have a realistic release window of late Summer 2014. I’ll make the “late” Summer joke so nobody has to… harf harf. But really, the reason was because we love our fans and want the game to be absolutely amazing. We're using our final weeks of development to reduce backtracking and tune difficulty to make sure this has the best pacing, humor, action, artwork, and overall satisfaction possible. We'd like to thank Matt Bozon for his time, and below are some more tasty screenshots to enjoy. omg... that is the "big" news!? i wanted the big news to be "release: NOW"
Great news! Now i just need to chose which platform to buy it on. 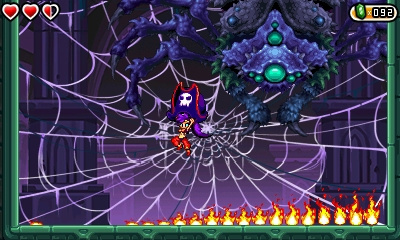 "Pirate's Curse is the biggest adventure yet — according to WayForward, it boasts more than double the content seen in its 2010 predecessor, Shantae: Risky’s Revenge." That cannot be true because the original is definately more than twice as big as the Dsiware one. Oh, and as more and more games come out on both the Wii U and 3DS the NL staff should remember to add questions regarding cross play, cross save and cross buy to developer interviews. 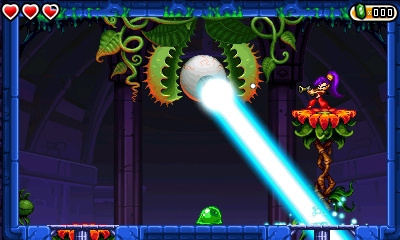 More platformers - I'll gladly give up dancing for pirate paraphernalia - and more Wii U games, both good news to me. Great news, I don't have a 3DS so I will now be able to get this on my Wii U! Oh helllllls to the yeah! It's looking really great from here. ...and I'm glad he touched up on the items she'll be using because I was wondering about that. Should be interesting to see how she copes without her transformations(though they'll be missed...sniffle, ha). @Romeo Well here's to hoping they surprise us this time in the reverse(a little sooner than they feel). Although the delays are obviously saddening, I'm glad they've taken the time to really make things for the better. So do we expect both versions to be released simultaneously? I will be picking the Wii U version, as usual when such a choice exists. Great news! But why reduce backtracking? It's a great way to make players look for hidden stuff if you make them return to an earlier place with new abilities that open new areas! @Romeo What delays are you talking about? It's had normal development time. The only reason it feels long is because they revealed it far, far earlier than they normally would so they could do so in the last regular issue of Nintendo Power. There's absolutely no reason to get so upset. @Kroisos yeah getting annoyed at delays is stupid but this was meant to be released last year is what I think they were talking about. W00t! That's awesome! This made my day. I can't wait to play this next year. Also pretty sure the trailer for this on the eShop still says 'exclusively for Nintendo 3DS'. Should probably amend that. "However, the Wii U version takes things to another level entirely, mixing HD artwork with pixel-based sprites." Ugh...that means "rushed port"...Please developers, pick one! Hand drawn or pixel or let us choose one entirely or the other. I hope they give us the option to turn off the "HD artwork" to keep the visuals consistent. @Romeo Because we don't want a rushed game that has plenty of development time? AWESOME! What an awesome reveal! Can't wait to play it on my Wii U! 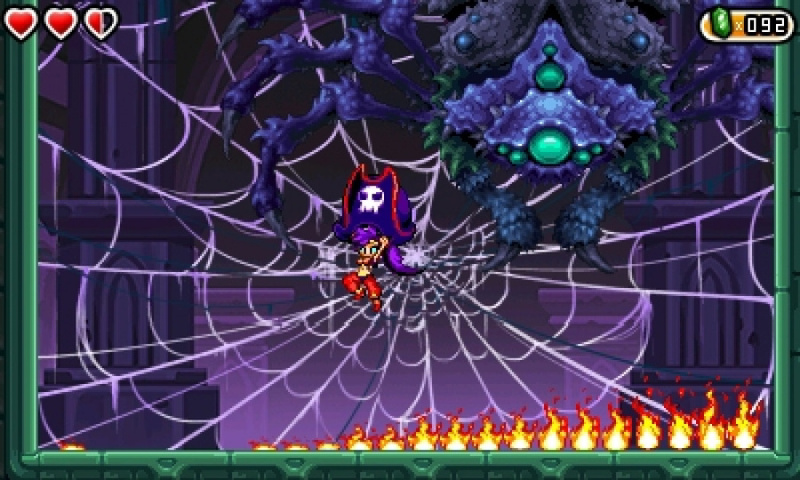 Thanks WayForward!! Hell yes. Hell to the YES!!! late summer june to August ? Nice I think I'll be getting the Wii U version unless crossbuy is an option? Good,now I can get Half Genie Hero and Pirate's Curse on the same console. @Drobotic I was just thinking the same thing. I pledged for that on kickstarter a while back. That's why you guys took so long. Will it support Wiimote or Classic Controller? If so, will get this instead of the 3DS version. Hope there's a simultaneous release, as I now want to play it on Wii U. IN HD!!! Great news. Definitely getting this on Wii U then. Those are some gigantic bosses. 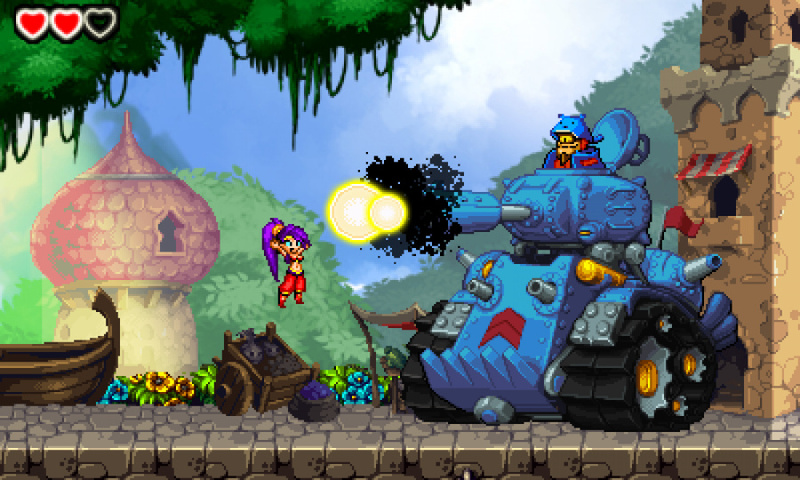 And...is that...Shantae carrying Rottytops? D'awww. I didn't enjoy Risky's Revenge much but I'm interested in Pirate's Curse, looks promising. Great news. I'd much rather play my Wii U than 3DS. Awesome. Sounds good. Will give me time to d/l, & play Revenge, though I have always wondered if Revenge will go on (typical eShop) sale (I mean, typical as in limited time)? Hope it's polished well. Looks great. I'll probably get it on 3DS for portability, & the 3d. 3DS version all day for me. Want to play this on my commute. There won't be cross buy. Cone on guys, we know for sure we will have to buy both versions. The Wii U version had better not draw resources away from the 3DS version. I don't want to be left with a gimped portable release of the game. It would have been preferable to release it first for 3DS and then work on an HD Wii U version. Glad to hear the game is still supposed to be large, though. I loved Risky's Revenge, but it was a bit too short. Something with the length and difficulty of the original game would be awesome. I'll pay attention to this, but to be honest, after playing and loving Switch Force 1 HD on the WiiU, I couldn't quite bear to buy the second one based on the pixel art. Maybe that's hypocritical as many games of the 16-bit days are still fun and worth some cash today, but it seemed more like a quick port than an artistic decision. And the art in Switch Force 1 HD is outstanding (as is the level design). I think this game would look a little better on the 3DS, and I can tell from the screens that it'd probably use the 3D to a decent effect, so I'll stick to that version. Totally getting Half-Genie Hero for the Wii U, though. This would be an instant buy for me IF I only had my 3DS. Now that I have my Wii U as well, not so sure. Never played this series so I'll wait for a review, but it looks great currently! Wait a sec… that trailer says that Pirates Curse is… the conclusion? But… what about Half Gennie Hero? They're not pulling a re-boot on us, are they? In any case, I think I'm still getting the 3DS version. I may get the Wii U version if there's anything significantly added in the time left of development. This game is looking incredibly good and is easily my No. 1 most wanted e shop game. I'll definitely be getting both versions of this one. Cannot wait! Eh, I guess that's cool. I'll still get it on 3DS, and wait until Half-Genie Hero to have Shantae on my Wii U.
I think I'll go for the Wii u version! Seems to be shaping up nicely. Has a certain GBA vibe. I'm looking forward to it. A bit of a shame it keeps getting pushed back. I'm really loving what I've seen of this game; even more so than anything I've seen of the new Shantae: Half-Genie Hero Wii U game.